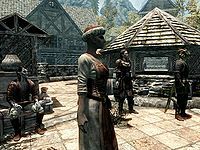 Marise Aravel is a Dunmer food vendor selling her produce near The Bee and Barb, close to Riften's market. She used to live in High Rock. She learned a trick from a butcher in Elinhir, a small town just over the border in Hammerfell, to keep food fresh and free of Rockjoint by using ground ice wraith teeth as a preservative. She needs help restocking her ice wraith teeth. She wakes at 5am and has breakfast for an hour before going to work. While at work, she can be found standing by her cart, advertising her produce and conversing with various people. When her workday finishes, she heads home at 6pm to have a one-hour dinner. She is supposed to sleep at 11pm but does not due to a bug. Marise wears a set of merchant clothes, a pair of boots, and a hat. She is equipped with a leveled dagger which can be up to elven quality. She carries a key to her house, a belted tunic, and a selection of common items and gold. You may see her giving a coin to beggars, saying to Edda, "You must be starving. Here, spend it well." and to Snilf, "Oh if only I could provide more than this coin. I hope it'll do." 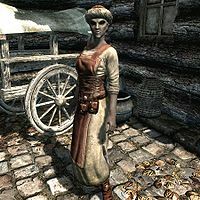 If you talk to her when she is working, she will boast about her produce, saying either "My food is the best in all of Skyrim; always as fresh as the day it was collected. ", "Some fresh meat to fill your belly perhaps? ", or "The only way to find fresher meats is to hunt it yourself." Approaching her when she is not working will have her say, "I run the meat and produce stand at the market. Come by and see me if you want some of the freshest food you've ever eaten." Upon ending conversation, she'll tell you, "Keep your belly full and your shoulders strong." If the quest Ice Cold is completed, she may also say, "Thanks again for the ice wraith teeth." She will promote her merchandise by saying things like "Fresh meats and produce! Get them before they're gone! ", "All meats guaranteed clean and free from Rockjoint! ", and "Vegetables as crisp as a winter's morning!" To start her quest, ask her how she keeps her food so fresh. She'll reply, "I picked up a trick from a butcher in Elinhir, a small town over the border in Hammerfell. He showed me a way to grind up ice wraith teeth and use it as a preservative. Keeps everything cold and fresh, but only for a limited time." She'll also offer you, "I'm always looking to replenish my supply, so if you ever come across five of them, I'd be more than happy to take them off your hands." You can tell her that you'll find some, and she'll be grateful: "Thanks, I was actually worried I'd run out." Expressing that you're not really interested will instead have her reply, "Oh! Well if you change your mind, come back and see me." If you already have five of the teeth in your inventory, you can also give them to her straight away. She'll say, "Perfect, just perfect! These should help keep my stock fresh for quite a while. And, as promised, here's my trade. Hope you like it." She will reward you with an apprentice-level spell tome and five pheasant breasts. Should you bring the teeth to her later, Marise's reply will be the same. Once you are on her quest, you may also ask her for any ideas where you can find some ice wraiths. She will suggest going to Ancient's Ascent to obtain the teeth but warns you of the danger involved: "Well, I'd be careful if I were you. I hear the Nords hunt them for some kind of initiation rite and not all of them end up victorious. The last traveler that traded me some said he found them at a place called Ancient's Ascent. Careful though, rumor has it a dragon makes its home there." If you are on her quest Ice Cold, she will instead tell you, "Be careful looking for those teeth... those little bastards are dangerous." When asked about the Ratway, Marise will tell you, "It's Riften's name for the sewers beneath our feet. Absolutely disgusting!" She will continue by advising you, saying, "If you fancy keeping your purse filled with gold and your head on your shoulders, I'd stay out of those awful tunnels." Should you ask, she'll also tell you about the Thieves Guild: "They live below the streets in the Ratway like dirty animals. And trust me, they're no better than the vermin that slink out of there for scraps. They make it difficult for decent people to earn a living. Of course, not many decent people live here in the first place." Bolli, a fisherman working at the Riften docks, may inform you that Marise sells fish that he caught: "If you're hungry, Marise sells fresh fish... caught by yours truly." This is the merchandise found in Marise's merchant chest. These items are only available if purchased from the merchant; they cannot be pickpocketed or stolen. They are restocked every two days. She is supposed to sleep in her house from 11pm to 5am, but doesn't, as the only bed there is owned by Madesi. She may be killed by another NPC while you're in Riften. Nobody will react to the fight, not even the guards. She may kill another NPC while you're in Riften. Nobody will react to the fight, not even the guards. ? She may say "Thanks again for the ice wraith teeth" even if you have not completed the Ice Cold quest. ? This page was last modified on 3 July 2018, at 20:04.